When smelting sponge, there is a feature that you can put empty buckets into the fuel slot to collect water evaporated from the wet sponge. However, if you put multiple buckets(For example: 16) into the fuel slot, it only gives you 1 water bucket, and the rest of the buckets(15 buckets) are nowhere to be found. To recreate this, place some wet sponge into the smelting slot, and 1 amount of fuel into the fuel slot. 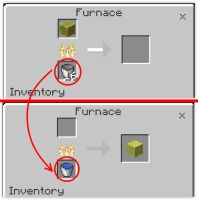 After the fuel disappears(as it is used by the furnace), place multiple buckets into the fuel slot. When one sponge is dried up, the fuel slot changes to 1 water bucket only, where the other buckets are gone.